Today is Basils birthday. 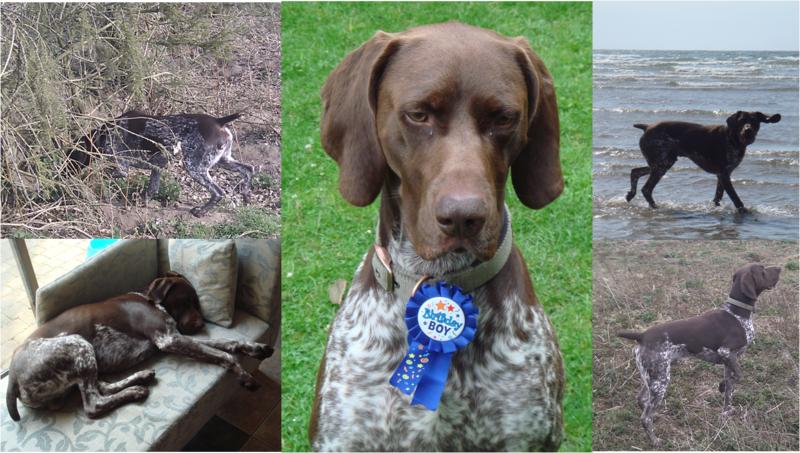 He’s our 4 year old German Shorthaired Pointer and effectively our third child! This is a little tribute to him and an opportunity to share some insights he’s given me on learning & leading. Originating funnily enough from Germany, the GSP emerged from deliberate cross breeding over 100 years ago. German estates found themselves shooting with kennels of dogs for different purposes and wanted a single breed that could do everything, principally Hunt Point & Retrieve (HPR). In particular they wanted a faithful companion that would be as happy at home with the family as out in the field shooting. The GSP was brought back to the UK both in WWI and WWII by returning servicemen and is now the most popular HPR breed in the UK. Basil is versatile and bred for that purpose, that is to hunt, point & retrieve as well as fit in with family life. He’s very intelligent (17th most intelligent breed apparently) and can multi-task. Ok not quite in the way my wife thinks but fundamentally he can do an awful lot. Why write about a versatile dog? Basil is bred for a purpose, namely to Hunt, Point & Retrieve. When he fulfils this purpose, using the abilities he was bred for, he comes alive and is fully content. When he isn’t used for his purpose, regardless of the number of walks he gets, he becomes bored and unruly. Makes sense really but think about this in the work context. If we’re doing what we truly desire to do we come alive. If we don’t we probably become bored and unruly. Basil is our pet right? Yes, but we must see him as an animal first, a dog second and a pet last. Often the problems owners have with their dogs is down to them the wrong order of pet first, dog second, animal last. The result? Indulged & confused dogs lacking the rules they need and unhappy and sometimes angry owners. There’s something here about the workplace too. The people we work with are humans first but often organisations see the human last and the function first. Guess what the result often is? People who are indulged or confused, and unhappy and sometimes angry management. There’s nothing stronger and more obvious than a dog looking to its owner for leadership. You can see them asking for it in their eyes. The role is demanded of you – undeniably. The only alternative is utter abandonment. In the workplace, such expectation may not be obvious in the eyes of your team, but I think that if you look carefully enough you can see it. Nonetheless the role is demanded of you – undeniably. The only alternative is utter abandonment. Training a gundog you become used to using a whistle for commands. This helps the dog hear you at a distance. Perhaps more importantly it takes all emotion out of what could have been a spoken command. Dogs are attuned to your emotions and the hormones you produce. If you are stressed, even if you try to control your voice, the dog knows. He may even stay away from you. If you are calm and quiet, guess what? The dog pays even more attention to you. Beyond voice, a dog will even read your body language – at the subtlest of levels. Basil looks for this direction. If I pay attention to a piece of ground, at a distance, he will notice this and go to cover that piece of ground. No voice or whistle required. He’s doing what he is best at and I’m supporting him with direction. · Your role is to support the team with direction. · They are the specialists – let them do what they are best at. · Your spoken word always conveys more about you than just those words. · If you are calm and quiet, people will listen to you more attentively. · In close proximity, at some level people detect stress hormones such as cortisol. So on Basils Birthday, I want to thank him for the lessons he teaches me and I hope some of the above prompts thought about what we can learn from the people we lead in the workplace. Happy Birthday friend!